Disclaimer: This post was sponsored by ConAgra, all opinions are my own. This is my third and final review of Healthy Choice products. 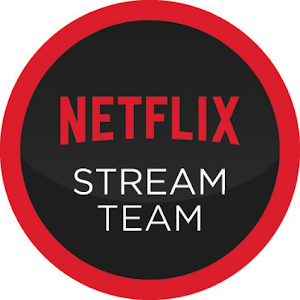 You can find the first and second posts here and here. Today I'm sharing Healthy Choice Baked Entrees. After a very long and . . . let's just leave it at long moving process, Whynot and I are finally in our new home! Just him, me and the furbabies and very little else. As we wait patiently for our belongings to arrive we've been a little creative when it comes to our day to day routine. It's a little like camping with a/c but no grill or utensils. We currently have no pots and pans for cooking so we've been living on meals we can prepare without them. Healthy Choice meals fit in perfectly! We can prepare the entrees in our microwave and eat right out of the container. 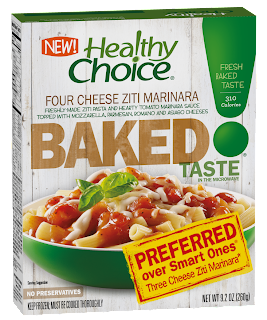 •	Healthy Choice Baked Entrées combine wholesome, quality ingredients like freshly-made pastas, flavorful sauces and blended cheeses. •	Baked Entrées not only deliver on the Healthy Choice nutrition people rely on, but also feature culinary favorites and ingredients that win on taste like no other. 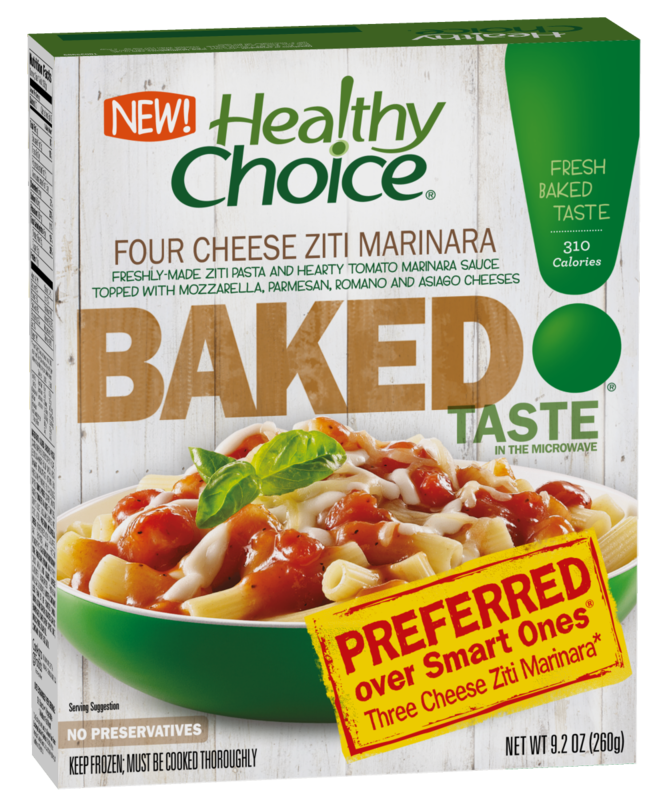 •	Healthy Choice Baked Entrées offer fresh, baked-from-the-oven taste straight from the microwave in ten delicious recipes. •	Four Cheese Ziti Marinara: Freshly-made ziti pasta tossed with classic marinara and topped with a blend of fine Italian cheeses; Parmesan, Romano, Asiago and mozzarella. •	Roasted Chicken and Potatoes: Savory slices of chicken breast with red skin potatoes, crisp carrots, and tender pearl onions in a light chicken and herb sauce. •	Fettuccini Alfredo Bake: A classic combination of freshly-made fettuccini pasta and rich Parmesan Alfredo sauce with crisp broccoli and topped with seasoned bread crumbs. •	Italian Sausage Pasta Bake: Freshly-made whole grain rotini pasta paired with juicy Italian sausage, tossed in a rich garlic marinara together with bubbling mozzarella cheese. •	Lasagna with Meat Sauce: Three rich layers of freshly-made pasta, hearty meat sauce, and ricotta cheese topped with mozzarella for perfection. •	Chicken & Rice Cheddar Bake: Whole grain brown & wild rice pilaf with crisp broccoli and sliced chicken breast in a creamy cheddar cheese sauce. •	Chicken & Spinach Alfredo: Freshly-made whole grain penne pasta tossed with sliced chicken breast, spinach and tomatoes in a creamy Alfredo sauce. •	Chicken Enchilada Bake: A full-flavored chicken enchilada over cilantro rice and topped with corn, black beans and a decadent queso sauce. •	Ravioli Marinara Bake: Rich ricotta and spinach filled al dente ravioli tossed in a tomato basil sauce and topped with fresh mozzarella cheese. •	Slow Roasted Turkey Bake: Slow roasted turkey breast accompanied by potatoes, butternut squash and crisp green beans topped with classical gravy and crispy onions. In less than 5 minutes from freezer to lawn chair (I said we were roughing it) we had a warm, tasty meal. Even better, it was under 300 calories and under the maximum 45 carbs Whynot is supposed to consume at each meal. We sampled the Slow Roasted Turkey Bake, our version of an early Thanksgiving. In all honesty, Whynot is not a fan of onions, but he was easily able to pick those off and still enjoyed his dinner. I especially like the new Even Bake tray that was specially designed to cook evenly so as to avoid those burnt edges. With all the choices Healthy Choice has available, we can try something new every night until our stuff arrives! Disclaimer: This post was sponsored by Wayfair.com, opinions are my own. 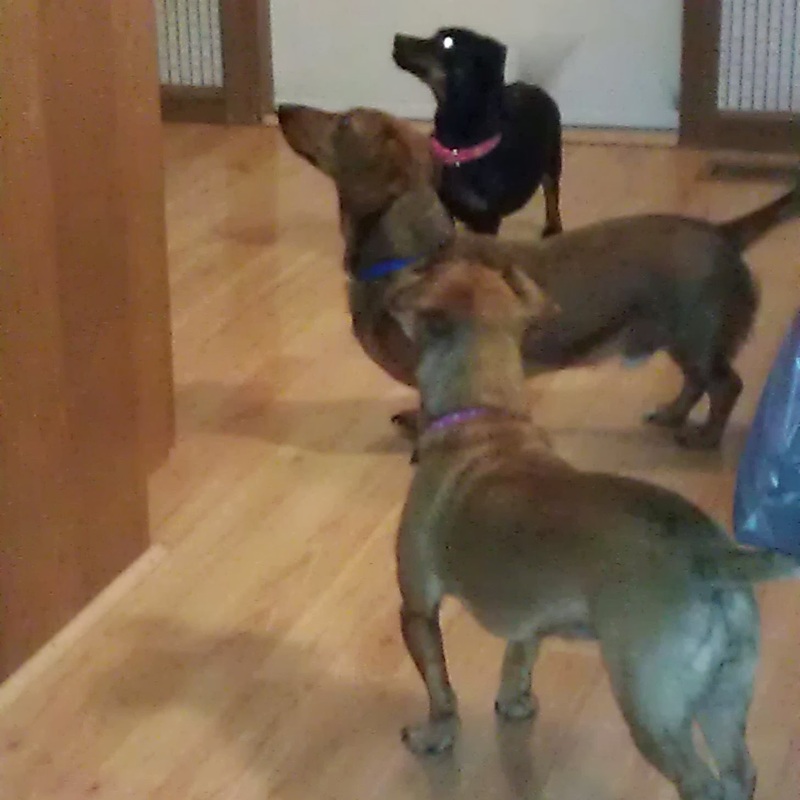 It's a holiday just for them! 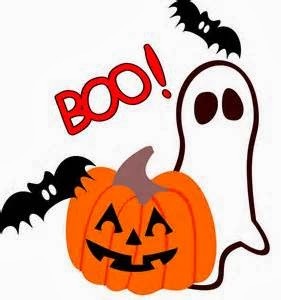 Halloween . 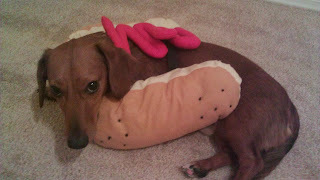 . . HalloWEENIE! 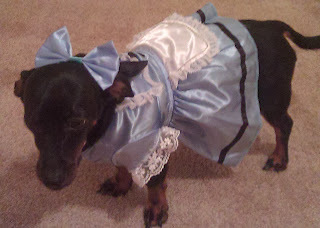 You've probably already started decorating your home for fall and prepared costumes for yourself and/or the kiddies but have you considered a costume your faithful four legged companion? Wayfair.com has a huge selection of costumes that will make Fido or Fifi feel like part of the crowd. If your furbaby isn't comfortable going out in full costume but still wants to go Trick or Treating, Wayfair has tons of LED collars and leashes to ensure your pup’s safety while collecting candy. Additionally, Wayfair is holding a pet photo contest! They'll be creating a fun pet Halloween album on Facebook where fans can vote on their favorite. 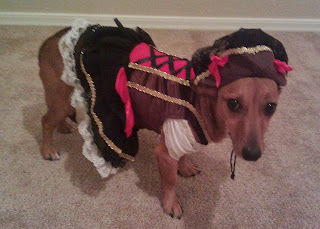 The most liked pet costume will then be featured at the top of our popular pet costumes page for Halloween. Here's a sneak peek at our costumes! Please go vote for my babies! The Ross Fall Trend Hunters promotion is live and will run through October 25th. Each week you will be able to choose your favorite look from Ross’ top three fall trends presented by our trend hunters – Black and White, Leather Details and Denim-on-Denim – for a chance to win one of three $100 Ross gift cards every week! Head over to the Ross Facebook today and vote for your favorite Black and White look! Kelsey is one of the bloggers chosen to participate in the Ross Fall Trend Hunter Challenge. I love the black and white striped sweater she chose. So comfy and under $25! Although I won't be heading to Ross for fashion any time soon, I'm excited to see what Ross has to offer for home decorating. I'm thinking lamps for our new master bedroom or maybe some throw rugs for the family room. I know I could use a splash of color in the kitchen as well! Whatever your needs, at Ross, you’ll find fashions for the whole family and products for every room in your home, all priced 20 – 60% off the same brands carried in department stores. Ross Dress for Less has generously agreed to offer one of my readers a $25 gift card to pick out a little something something to put a smile on your face. Leave me a comment below telling me what you might purchase with $25 at Ross. Include your email address so I can contact you in case you win.